Draft: 2006, Cincinnati Reds, 7th rd. 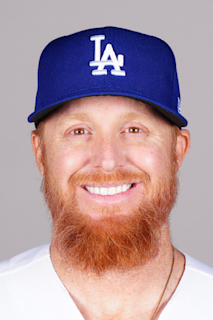 Justin Matthew Turner…married to Kourtney…launched the Justin Turner Foundation in 2016, which supports homeless veterans and children (and their families) battling life-altering illnesses...played at Cal State-Fullerton... was a member of the 2004 College World Series champions...named to the College World Series All-Tournament team as a shortstop as a freshman, and a second baseman in his senior year…graduated from Mayfair High School (CA) in 2002, where he played baseball...was named League MVP his senior year…has been an active participant in the team's community efforts during his time in Los Angeles...is a frequent visitor to the Los Angeles Dream Center and has made numerous trips to Cedars-Sinai Hospital to visit with patients...selected by the Cincinnati Reds in the seventh round of the 2006 First-Year Player Draft. Posted a .312/.406/.518 slash line with 62 runs, 31 doubles, one triple, 14 home runs and 53 RBI despite being limited by injuries to 103 games…the Dodgers went 63-40 when Turner appeared in a game ... Drew 47 walks and was hit by a team-leading 12 pitches, while striking out 54 times ... Among hitters with 400 or more PA, ranked fifth in batting average, fourth in OBP and ninth in OPS (.924) ... Dominated left-handed pitchers, hitting .336 (40-for-119) with 15 doubles, one triple, four homers and 17 RBI along with a 1.028 OPS…posted the fifth best batting average against southpaws in the National League, while his OPS ranked fourth on the Senior Circuit ... Posted .962 fielding percentage (10 E/777.0 INN) at third base, which was the 10th best fielding percentage among big league third basemen (min. 750.0 INN) ... In 55 games following the All-Star break, he ranked among big league leaders in batting average (.356, 2nd), OBP (.447, 3rd), SLG (.619, 5th), OPS (1.066, 4th), doubles (24, 2nd), extra-base hits (34, 8th) and hit by pitches (8, T-4th)…finished with the sixth best OPS in franchise history post All-Star break, trailing just Manny Ramirez (1.232, 2008), Mike Piazza (1.147, 1997), Duke Snider (1.132, 1953), Adrian Beltre (1.106, 2004) and Shawn Green (1.071, 2001) ... Voted the National League Player of the Month for August after batting .402 (39-for-97) with 22 runs, 11 doubles, one triple, six home runs, 20 RBI and a stolen base across 25 August games to claim his first career NL Player of the Month Award, and second monthly award overall after earning NL Rookie of the Month honors in May 2011…became just the seventh player in franchise history to bat .400-or-better with at least 18 extra-base hits in a single calendar month, joining Hall of Famers Jackie Robinson (May 1949) and Zack Wheat (August 1925), as well as Del Bissonette (May 1930), Babe Herman (July 1930, July 1929) and John Frederick (May 1929) ... Batted .464 (26-for-56) during a 14-game hitting streak from Aug. 4-20…tied for the second-longest streak of his career ... Collected his fourth career walk-off hit with a game-winning RBI double on August 25 against the Padres ... Appeared in all 16 of the Dodgers' Postseason games, going 20-for-67 (.299) with a .373 OBP, three doubles, a homer and four RBI…hit .333 (8-for-24) in the World Series vs. Boston ... Named the clubs' 2018 nominee for the prestigious Roberto Clemente Award, the most prominent individual player award bestowed by MLB…was selected as the Dodgers' nominee for a second consecutive season ... Opened the season on the DL after he was hit by a pitch during a Spring Training game vs. Oakland on March 19, sustaining a small non-displaced fracture of his left wrist…returning to the Dodger lineup on May 15…also placed on DL from July 23-Aug. 2 with a right groin strain. First time All-Star posted a .322/.415/.530 slashline with 72 runs, 32 doubles, 21 home runs and 71 RBI in 130 games… finished third in the National League in batting average (5th, ML), while also ranking second in OBP (4th, ML) and eighth in OPS (.945) ... His .380 batting average (54-for-142) against left-handed pitchers ranked fourth in the big leagues, while he led the Majors in OBP (.477) and ranked third in OPS (1.181) ... Went 30-for-100 (.300) with RISP and batted .319 (65-for-204) with runners on base, which ranked 18th in the National League ... Recorded a team-high tying 42 multi-hit games, which also tied for 16th in the NL…also ranked ninth in the senior circuit with a 5.5 WAR, according to Fangraphs.com ... Finished eighth in the National League MVP voting ... Selected to his first All-Star game, earning the spot via MLB's Final Vote, tallying an all-time record of 20.8 million votes during the four-day balloting ... Prior to the All-Star break, he led the Majors (min. 200 AB) with a .377 batting average and a .473 OBP in 65 games, while recording 17 doubles, 10 homers, 37 RBI, 28 multi-hit games (T-7th, NL) and a 1.056 OPS (3rd, ML)…his OBP ranked 13th best at the All-Star Break since 1969 in the NL ... Recognized as the Dodgers' Roy Campanella Award winner, which is given to the Dodger player who best exemplifies the spirit and leadership of the late Hall of Fame catcher, and is voted on by Dodger players and coaches…also was the club's nominee for the Roberto Clemente Award ... Capped off a career-high 16-game hitting streak from April 13-30, hitting .433 (26-for-60) with six doubles, one home run and nine RBI along with a 1.083 OPS ... Appeared in all 15 postseason games for the Dodgers and posted a .286 (16-for-56)/.420/.536 slashline with eight runs, two doubles, four homers and 14 RBI…drove in the most runs in a single postseason in Dodger history, while his four longballs tied for second most by a Dodger in a single postseason…named NLCS co-MVP with teammate Chris Taylor ... Placed on the 10-day disabled list from May 19-June 9 with a right hamstring strain. Batted .275 and posted career-highs in runs (79), hits (153), walks (48), doubles (34), triples (3), homers (27), RBI (90) and games played (151)...Ranked 12th in the NL with a .305 batting average vs. right-handed pitchers (117-for-384), with 22 of his 27 homers coming off righties...Hit .325 with runners in scoring position - the 13th-best mark in the NL - and hit .300 with runners on base (76-for-253)...Got off to a slow start, but posted a .307/.356/.577 slashline over his final 91 games after June 13, going 108-for-352 with 25 doubles, 22 homers and 69 RBI…in that span, ranked among the NL leaders in average (15th), doubles (10th), homers (T-6th), slugging percentage (5th) and RBI (T-3rd)…hit only .221 (45-for-204) during his first 60 games through June 12...Was a Gold Glove finalist and ranked fourth among NL third basemen with a .972 fielding percentage…appeared in 144 games (138 starts) at third base and one game at first base...Reached base safely in 10 of 11 postseason games, posting .286/.457/.514 slashline…went 10-for-35 with six runs, a triple, two homers and eight RBI…slugged his first career postseason home run with a two-run shot in the third inning in Game 1 of the NLDS...Selected as a finalist for the Players Choice Award for Marvin Miller Man of the Year honor. Appeared in a career-high 126 games after winning the starting spot at third base…batted .294 with 26 doubles, a triple, 16 homers and 60 RBI, tying a career high with 113 hits (also: 2011) and setting career-best marks in home runs and RBI. ... Ranked 12th in the NL (min. 350 AB) with a .370 on-base percentage and placed 13th with a .491 slugging percentage. ... Batted .312 against right-handed pitchers, the fourth-best mark in the NL by a right-handed hitter (min. 250 AB). ... Hit .356 with runners on base (58-for-163) and batted .322 (29-for-90) with RISP. ... Batted .314 (54-for-172) with a .388 on-base percentage, 15 doubles, eight homers and 33 RBI in 60 home games…ranks third among active players (min. 100 AB) with a .318 batting average in 127 career games at Dodger Stadium. ... Posted a .963 fielding percentage, appearing at all four infield positions - 10 games (six starts) at first base, five games (three starts) at second base, 100 games (88 starts) at third base and one start at shortstop. ... Tied a career high with four hits on two occasions, April 19 vs. Colorado and July 20 at Atlanta. ... Hit safely in all five postseason games (four multi-hit games), going 10-for-19 (.526) with two runs scored, six doubles and four RBI in the NLDS vs. New York…his six doubles tied for the most ever by any player in a single postseason series along with the Yankees' Hideki Matsui (2004 ALCS) and the Tigers' Pete Fox (1934 World Series)…his 10 hits were the most by a Dodger in a postseason series since Steve Garvey's 10 in the 1981 World Series and tied for the second most in a postseason series in franchise history. ... Placed on the DL from July 31-Aug. 13 with a right thigh skin infection. ... On Oct. 22, had arthroscopic surgery performed by Dr. Neal ElAttrache on his left knee to clean up loose bodies. Appeared in 86 games for the Mets in a versatile role, seeing action at all four infield positions…batted a career-high .280 with two homers and 16 RBI...Posted a .989 combined fielding percentage at third base (23 games), shortstop (18 games), first base (15 games) and second base (12 games), while appearing in the outfield (left field) for the first time in his career on May 8 against the White Sox...Started the season off hot, batting .368 (14-for-38) with three doubles and four RBI in 15 April games...Placed on the disabled list from June 18-July 22 wtih an intercostal strain...had short rehab assignments with four minor league affiliates. Spent his first full season in the majors...Made one trip the 15-Day DisabledList, May 29-June 16, with a sprained right ankle...Set a career-high in batting average...Made his first major league appearance at first base on April 10 vs.Washington...Started, handled five chances cleanly and went 1-4...Hit in the three spot of the line-up for the first time in his career on April13 at Philadelphia...Went 0-4 and scored a run...Worked a bases-loaded, ninth-inning walk in a 13th pitch at-bat vs. HeathBell to tie the game 2-2 on April 26 vs. Miami...Made his first career start at shortstop on May 7 at Philadelphia...Went 2-8 in two games for Buffalo (AAA) of the International Leaguebefore being activated from the DL on June 16...Tied his career-high with four hits on July 6 vs. Chicago (NL)...It marked thethird time he had four hits in a game and the first time since July 10, 2011at San Francisco...Hit his first home run since August 6, 2011 on August 25 vs. Houston (offMickey Storey)...Snapped a string of 263 at-bats without a home run...Went 12-48 (.250) with three doubles, five walks and six RBI as a pinchhitter...Was 23-62 (.371) during day games. Recalled from Buffalo (AAA) of the International League on April 19 and remained with the Mets for the remainder ofthe season...Finished fourth among National League rookies in RBI, hits and runsscored, fifth in multi-hit games (26), second in doubles, third in walksand fourth in extra-base hits (34)...Had a career-best four hits twice: May 27 vs. Philadelphia and July 10at San Francisco...Set a Mets rookie record with at least one RBI in seven consecutivegames from May 14-May 21...Drove in 12 runs during the stretch,which broke Ron Swoboda's old mark of six games from August 22-August 26, 1965...Also had nine RBI over a four-game span from May15-May 19...Four other Mets rookies had accomplished thatfeat...Jose Reyes (10 in 2003), Mike Jacobs (nine in 2005), DarrylStrawberry (nine in 1983) and Steve Henderson (nine in 1977)...Turner, who played in 42 games in the majors at the time of hisseven-game RBI streak, was only the third player to make his majorleague debut in the expansion era (since 1961) and record a sevengameRBI streak within his first 50 games in the majors...The otherswere Ryan Braun from June 19-June 26, 2007 and Pedro Alvarez fromSeptember 21-September 27, 2010...Compiled another six-game RBI streak (six total) from May 25-May 30...Became the third rookie in major league history with at least oneRBI in 13 of 15 games after going 2-4 with an RBI on May 30 vs.Pittsburgh...Pinky Whitney of the Phillies in 1928 (14 of 15 games)and Buster Chatham of the Boston Braves in 1930 (13 of 15)...Became the fourth rookie in team history with at least 30 doublesin a season...Ty Wigginton holds the franchise record for rookieswith 36 doubles in 2003, Ike Davis is second with 33 doubles in 2010and Kazuo Matsui collected 32 doubles in 2004...Turner reached 30doubles one season after Davis did...Since 2000 five other teams hadrookies accomplish the feat in consecutive seasons...The Mets (2003-2004), Colorado (Matt Holliday in 2004 and Garrett Atkins in 2005),Oakland (Bobby Crosby in 2004 and Nick Swisher in 2005), SanDiego (Josh Barfield in 2006 and Kevin Kouzmanoff in 2007) andTampa Bay (Delmon Young in 2007 and Evan Longoria in 2008)...Was hit by a pitch 10 times to tie Jason Phillips (2003) for thesecond-most in team history by a rookie...Ron Hunt holds therookie mark with 13 hit-by-pitches in 1963...Reached safely (via hit, walk or hit-by-pitch) at least once in 28 straight games from June 1-July 6, the longestsingle season streak by a rookie in team history....Mike Vail set the mark with 27 straight from August 24-September 16, 1975 and Steve Henderson matched it, July 5-August 5, 1977...Hit .350 (35-100) with runners in scoring position, sixth-best in the NL (0.62 plate appearances/team game)...Became the first Mets player to win NL Rookie of the Month, capturing the award for May...Hit .325 (27-83) with a homerun and 20 RBI in the month...Picked up his first RBI with the Mets on April 27 at Washington...Singled home a run in the third inning...Delivered a pinch-hit, two-run, go-ahead single in the eighth inning on May 7 vs. Los Angeles (NL)...Hit .400 (4-10) withtwo doubles and three RBI as a pinch-hitter...Hit his first major league home run on May 15 at Houston (off Aneury Rodriguez)...Fashioned a streak of three straight games with multiple hits, May 15-May 18...Drove in a career-best five runs on May 15 at Houston to become the 10th Mets second baseman to do so in asingle game...Jose Valentin holds the record with seven RBI in game two of a doubleheader on July 8, 2006 vs. Florida...Put together a then career-best hitting streak of eight games from May 13-May 21...Hit .424 (14-33) during this spanwith six doubles, one home run, and 12 RBI...Picked up a game-ending RBI on June 22 vs. Oakland...Was hit by a pitch in the 13th inning to send the team to a 3-2win and its first walkoff win of the year...Hit in 14 of 15 games from July 9-July 29 (23-67, .343)...Had a career-high 11-game hitting streak from August 26-September 11...Hit .386 (17-44) during that streak...Alsofashioned a 10-game streak from July 19-July 29...Hit .333 (15-45) in that span...In late-inning pressure situations with runners on, he hit .414 (12-29)...Collected his first career multi-home run game (two), August 6 vs. Atlanta (both offTommy Hanson). Was claimed off waivers from the Baltimore Orioles on May 25...Recalled from Buffalo (AAA) of the International League on July 16...Optioned back to Buffalo on July 20...Appeared in four games with the Mets, with one start at second base, July18 at San Francisco...Saw action in two other games at second base and one game at third, July19 at Arizona...Started the year with the Baltimore Orioles and went hitless in his first nineat-bats in the big leagues from April 12-April 23...Finished fifth in the International League with a .316 (125-396) batting average...Hit .333 (104-312) in 78 games with Buffalo and .250 (21-84) in 23contests with the Orioles' Norfolk (AAA) team of the International League...Tied for first on the Bisons in runs scored...Ranked third in hits, and fifth indoubles and extra-base hits (34)...Hit home runs in back-to-back games twice: July 7-July 8 and August 31-September 1...With Buffalo, hit .380 (30-79) in 19 games in June, .360 (27-75) in 21contests in July and .344 (11-32) in seven games in September...From July 1-August 31 his .370 average was second in the InternationalLeague...Hit safely in 17 of 18 games from July 4-August 2...Hit .408 (29-71) in thosecontests...Went 6-6 and hit for the cycle vs. Rochester in the last game of the seasonon September 6...Scored four runs...Became the first Buffalo player to hit forthe cycle since outfielder Mark Little accomplished the feat in Rochester onApril 26, 2004...Also became the first Bisons' player to collect six hits in agame in the modern era...The last six-hit game by a Buffalo player was byHoward "Butch" Meyers on June 29, 1936 at Rochester...Saw action at second base, shortstop and third base...Compiled a .366 (52-142) batting average after the All-Star break...Hit .374 (37-99) vs. lefthanded pitchers and .315 (67-213) vs. righthanders...Went 4-4 with two home runs vs. Columbus on July 29...For the season he had 14, two-hit games; nine, three-hit games; two, four-hit games and the six-hit contest...Hit safely in his first 10 games with Buffalo from May 28-June 7...Was 14-41 (.341) in that span...Also had another 10-game streak from July 22-August 2...Batted .457 (16-35) during that streak. Split the season between Class-A Sarasota (.316 in 33 games) and Double-A Chattanooga (.289 in 78 games)...Hitsafely in 19 of his first 20 games with Sarasota, including a 14-game hitting streak, April 14-28, during which he batted .433(26-60)...Collected multiple hits in 12 of his 33 games with Sarasota, including 4 on April 14 at Lakeland...Joined Chattanoogafor his first game on May 15 vs. Mississippi (0-3, 2BB, R)...Went a career-best 5-for-5 with a home run and 3 RBI on July 2 vs.West Tennessee...Hit .370 (30-81) in 22 August games...Batted .372 (32-86) against lefties and .253 (49-194) against rightieswith Chattanooga...Batted .337 (30-89) with 7 doubles, a home run, 15 RBI and 18 runs scored in 23 games with Peoria in theArizona Fall League. Batted .338 (3rd in the organization) with 6 HR, 41 RBI and 12 stolen bases in 60 games with Rookie Billings...Rankedamong Pioneer League leaders in BA (4th), and runs scored (4th, 53)...Hit safely in 50 of his 60 games...Recorded a 17-gamehitting streak, August 5-21, batting .411 with 19 runs scored (30-73)...Collected 2 hits in 5 consecutive games, July 27-August1 (10-22, .455)...On August 17 vs. Orem, had his first professional 4-hit game...Had a season-high 4 RBI on September 4 vs.Missoula...Was named to the Pioneer League Post-Season All-Star Team. August 2, 2018 Los Angeles Dodgers activated 3B Justin Turner from the 10-day injured list. July 23, 2018 Los Angeles Dodgers placed 3B Justin Turner on the 10-day disabled list. Right groin strain. May 15, 2018 Los Angeles Dodgers activated 3B Justin Turner from the 10-day disabled list. May 12, 2018 Los Angeles Dodgers sent 3B Justin Turner on a rehab assignment to Rancho Cucamonga Quakes. March 29, 2018 Los Angeles Dodgers placed 3B Justin Turner on the 10-day disabled list retroactive to March 26, 2018. Left wrist fracture. June 9, 2017 Los Angeles Dodgers activated 3B Justin Turner from the 10-day disabled list. June 5, 2017 Los Angeles Dodgers sent 3B Justin Turner on a rehab assignment to Rancho Cucamonga Quakes. May 19, 2017 Los Angeles Dodgers placed 3B Justin Turner on the 10-day disabled list. Right hamstring strain. December 23, 2016 Los Angeles Dodgers signed free agent 3B Justin Turner. November 3, 2016 3B Justin Turner elected free agency. August 13, 2015 Los Angeles Dodgers activated 3B Justin Turner from the 15-day disabled list. July 31, 2015 Los Angeles Dodgers placed 3B Justin Turner on the 15-day disabled list retroactive to July 27, 2015. Right thigh skin infection. July 18, 2014 Los Angeles Dodgers activated 3B Justin Turner from the 15-day disabled list. July 13, 2014 Los Angeles Dodgers sent 3B Justin Turner on a rehab assignment to Rancho Cucamonga Quakes. June 29, 2014 Los Angeles Dodgers placed 3B Justin Turner on the 15-day disabled list. Left hamstring strain. March 16, 2014 Los Angeles Dodgers selected the contract of 3B Justin Turner from Albuquerque Isotopes. February 7, 2014 3B Justin Turner assigned to Albuquerque Isotopes. February 6, 2014 Los Angeles Dodgers signed free agent 3B Justin Turner to a minor league contract and invited him to spring training. December 2, 2013 3B Justin Turner elected free agency. July 22, 2013 New York Mets activated 3B Justin Turner from the 15-day disabled list. July 19, 2013 New York Mets sent 1B Justin Turner on a rehab assignment to Brooklyn Cyclones. July 16, 2013 New York Mets sent 1B Justin Turner on a rehab assignment to Binghamton Mets. July 15, 2013 1B Justin Turner roster status changed by Binghamton Mets. July 15, 2013 Justin Turner roster status changed by Binghamton Mets. July 14, 2013 New York Mets sent 1B Justin Turner on a rehab assignment to St. Lucie Mets. July 13, 2013 New York Mets sent 1B Justin Turner on a rehab assignment to GCL Mets. June 18, 2013 New York Mets placed 1B Justin Turner on the 15-day disabled list retroactive to June 17, 2012. Left intercostal strain. June 16, 2012 New York Mets activated 1B Justin Turner from the 15-day disabled list. June 14, 2012 sent 2B Justin Turner on a rehab assignment to Buffalo Bisons. May 29, 2012 New York Mets placed 2B Justin Turner on the 15-day disabled list. Sprained right ankle. April 19, 2011 New York Mets recalled Justin Turner from Buffalo Bisons. March 23, 2011 New York Mets optioned Justin Turner to Buffalo Bisons. November 18, 2010 2B Justin Turner assigned to Leones del Escogido. October 13, 2010 Justin Turner roster status changed by New York Mets. July 21, 2010 New York Mets optioned Justin Turner to Buffalo Bisons. July 16, 2010 New York Mets recalled Justin Turner from Buffalo Bisons. May 25, 2010 New York Mets claimed 2B Justin Turner off waivers from Baltimore Orioles. May 25, 2010 New York Mets optioned Justin Turner to Buffalo Bisons. May 21, 2010 Norfolk Tides designated 2B Justin Turner for assignment. May 21, 2010 Baltimore Orioles designated 2B Justin Turner for assignment. April 24, 2010 Baltimore Orioles optioned 2B Justin Turner to Norfolk Tides. April 12, 2010 Baltimore Orioles recalled Justin Turner from Norfolk Tides. March 30, 2010 Baltimore Orioles optioned Justin Turner to Norfolk Tides. September 8, 2009 Baltimore Orioles selected the contract of Justin Turner from Norfolk Tides. June 26, 2009 Justin Turner roster status changed by Norfolk Tides. June 11, 2009 Norfolk Tides placed 2B Justin Turner on the 7-day disabled list retroactive to June 9, 2009. Sprained wrist.